Google has shipped a million Nexus 4 devices, according to estimates. And this is despite shortages that have seen it out of stock on Google Play for long periods since its launch back in November. 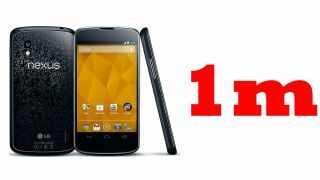 A member of the XDA Developers Forum posted that the 999,998th Nexus 4 was produced on February 5. Apparently it was a black device that was sold in Turkey. The user ("draugaz") worked it out from the device's IMEI number. There's no official word from Google on the numbers, but a source told TechCrunch that the Android-maker is "very happy" with the success so far. The Nexus 4 has been out of stock on Google Play for most of the time since launching in November, so shipping a million is quite a feat. The device has been on sale through networks in some countries - including the UK - but for a much higher price than buying direct from Google. Google blamed LG (which makes the phone) for the shortage; LG in turn said it was all Google's fault. Members of the same forum have also estimated Nexus 4 production runs by month. In October Google is said to have produced 70,000, with 90,000 in November, 210,000 in December, and a jump to more than 550,000 in January. The Nexus 4 is one of the best handsets of recent months, with top specs and a low price. The 4.7-inch handset runs Android 4.2 Jelly Bean, with an 8-megapixel camera on the back, NFC, wireless charging and 2GB of RAM. It went back in stock on Google Play in the UK last week, with shipping time listed as one to two weeks.